Is India changing its development paradigm? “India cannot go through constructing another Sardar Sarovar Dam,” Indian Minister of Rural Development Jairam Ramesh said last week while discussing the Land Acquisition Bill with reporters in Delhi. Ramesh argued that enormous and major irrigation projects, such as the long debated hydroelectric and irrigation project SSD, are no longer practicable. The reason? They require large-scale land acquisition and displacements of people, who almost never get compensated. This statement comes after the new Land Acquisition Bill went to President for its final assent. The Minister visited a village in the Narmada Valley and spent some time with local activist and communities. Although the statement has been welcomed by Indian EJOs, unsolved questions remain. In a reponse by Medha Patkar, from the now 3 decades old and world famous Narmada Bachao Andolan social movement, much can be learned on the long road to environmental justice in India. For recent reporting on massive mobilization, read our article from September 9. We welcome the recent statement of the Union Minister of Rural Development, Shri Jairam Ramesh that there would be no more Sardar Sarovar like Projects in India. The reasoning and the rational that such gigantic projects lead to massive displacement of not just families, but whole communities, following forcible acquisition of generations-old land and properties is quite understandable and acceptable. Although a delayed statement, it is definitely one that shows a realization of the reality of such large project and their impacts. Not only the inter-state conflict that the Minister refers to, but also the permanent conflict between the State and its citizens is also a reason for review of such conflict-ridden projects. While the lessons learnt from Sardar Sarovar and the people’s struggle over the last 28 years have gone a long way to partly change the perspective and also the water resource planning by the World Bank first and our own governments later, it is unfortunate that in the name of Sardar Sarovar and other Narmada dams, Chief Minister and officials of Madhya Pradesh, as Mr. Ramesh acknowledges, could ‘convince’ him to exempt irrigation projects from two of the significant provisions in the new Land Acquisition Bill, 2013. Those include allotment of 1 acre land per family in the command area as well a pre-condition of Social Impact Assessment before a project is sanctioned as a Public Purpose Project. 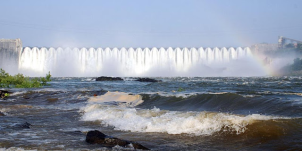 It is equally unfortunate that the real reason behind Sardar Sarovar like Projects being non-feasible or impractical is not just the mind-boggling social and ecological impacts, but also the incapacity, corruption and lack of political will of successive governments and their officials that have led to massive escalation in costs and minimal realization of even the projected benefits. This needs to be brought on record since neither Sardar Sarovar nor the conflict and struggle has yet become a tale of the past, but continues till date, raising extremely critical questions for the entire development paradigm of this nation. It is in the inter-state Sardar Sarovar Project where the people – adivasis, farmers, fish workers, potters, landless, artisans, shopkeepers etc. highlighted all issues including social and environmental impacts as well as unjustifiable costs, exaggerated benefits and unfair distribution of the same, including water allocation and sharing within Gujarat. An objective analysis of each of these aspects would lead to one and only one conclusion and that is: Even today SSP stands to be a perfect case for suspension of further dam work and reviewing the Project itself. There continue to be 250,000 people residing in the submergence area in the three states of Madhya Pradesh, Maharashtra and Gujarat till date, fighting not just for their rights, but for the right kind of development. It is true that during the 3 decades of struggle, this is the only dam where 11,000 families have got land for land in Maharashtra and Gujarat and about 300 resettlement sites had to be established for the thousands of families in the three states. However, not less than 7,000 – 8,000 families remain to get alternative land which is their legal entitlement. Madhya Pradesh, with the largest of submergence has been callously avoiding to provide cultivable land to displaced persons, whether in SSP or other large dams in the Narmada valley, while in the same state, huge chunks of land and resources are diverted to the corporates! Over the years, the Andolan has exposed a huge corruption scandal in the rehabilitation, worth about Rs. 1,000 crores (118 million euro). Not less than 3,000 fake registries in the name of land purchase and 8,000 fake documents claiming livelihood based rehabilitation of landless has meant wastage of crores of rupees from the state exchequer. Who are the culprits? The Report by the Judicial Commission of Inquiry, which has been investigating, for the past five years, as per Orders of the M.P. High Court will bring out the truth. Severe non-compliance on various environmental aspects such as command area development, catchment area treatment, impact on health and fisheries, downstream impacts, archeology, seismicity etc. has been reported by not one but many official committees including the latest Dr. Devendra Pandey Committee appointed by MoEF. Mr. Ramesh as the then Environment Minister had himself written to Mr. Narendra Modi, Chief Minister, Gujarat on the various aspects of non-compliance. There are, to this day, millions of trees, hundreds of temples, mosques and other monuments, small and large of immense cultural significance in the submergence area. Can the State restore the generations old archeological remnants that lie underground in this oldest of the civilizations in the world? Can anyone ‘rehabilitate’ this heritage ever? While Gujarat, supported by Madhya Pradesh, ready to sacrifice its own people and villages has been justifying all destruction, in the garb of ‘development, one really has to look at the benefits front to see if all the displacement is actually serving any ‘public purpose’? The financial cost of the project itself has escalated from Rs. 4,200 crores (1983) presumed for economic appraisal to Rs. 6,488 crores (1988) approved by the Planning Commission to the peak of 7,000 crores in 2012 (826 million euro). What is the Benefit-Cost ratio today needs to be looked at in utmost seriousness. Even the Planning Commission could have but has not, never reviewed the same. Pushing the dam ahead from 122 mts to 139 mts, but not building the canal network over 30 years has resulting in irrigation falling behind and no use of the reservoir waters already ponded and available. The dam with 1450 MW of firm as power generation capacity would generate only 415 MW firm power and the same would also go on reducing as and how the irrigation comes into being and takes water allocated for the same purpose. Maharashtra and Madhya Pradesh, however, are not entitled to even a drop of water from SSP, but only 27% and 56% of whatever power is generated at every level of the dam height respectively. While official data shows that power generation at SSP, commenced since 2004, Maharashtra and M.P. have not received the exact amount of the power they are entitled to. Is it fair for a Project, built and pushed ahead in the name of needy farmers and villages of Kutch and Saurashtra to divert waters, on a large scale, to corporates, urban municipalities and cities in Gujarat? Is the decision of the Modi Government to exclude 4 lakh (400 000) hecatres of land from the command area and reserve the same for corporates, SEZs, SIRs etc. a ‘farmer-friendly’ move or a fatal blow to the farmers in the state? How has the cost benefits ratio been affected by these changes is for anyone to imagine. Is the sacrifice of the Narmada valley necessary and justifiable for satisfying corporate greed and political vested interests, by changing the very plan of Sardar Sarovar? No doubt, M.P. and Gujarat are deliberately indifferent to the huge losses that have occurred due to submergence since 1993 to 2013, to the lives and livelihoods of 2.5 lakh (250.000) people, to the thousands of houses, schools, dispensaries, shops, markets, temples, mosques, adivasi religious structures, lakhs of trees, all that is part of thriving village-life in the valley till date and all that is doomed to be drowned if the 17 mts gates on Sardar Sarovar are to be installed. Will the Rural Development Minister who visited one of the villages (Chikalda) in the valley, a few months ago live up to his promise of ensuring justice to the 48,000 families? Coincidentally it at was Chikalda where the Asia’s foremost farmers were born, that Mr. Ramesh announced commitment by his government to ensure justice to the valley. Barely months after his visit, Chikalda witnessed its worst dam-induced submergence, with over 350 houses hit by the dam waters and hundreds of acres of land, with standing crop submerged. Will the Minister take the initiative to ensure justice to review the project? Will he ensure lawful rehabilitation of the thousands of families already affected and save the rest of the habitations and heritage in the valley?